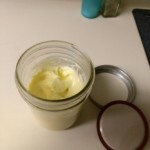 Rick Carroll – R. W. Carroll, Inc.
Add egg, oil, lemon juice, and salt (in that order) to wide-mouth pint mason jar. Insert hand-held mixer and mix starting at bottom of jar for 15-20 seconds until mixture comes together. Then bring blender up to thoroughly mix. Keep refrigerated. I try to use mine up within a couple of weeks. Not sure where this text is gonna go, but this sample text should show that. This post is here to test the new template….